In Spanish, Bronco means rough, and that's the word that American cowboys adopted to describe an untrained horse. Today's Nice Price or Crack Pipe Bronco II looks anything but rough, and its Mustang drivetrain should make for one fun rodeo. Will its price however, be low enough to rope you in? There's an old expression - given enough rope - which basically means that, provided the necessary resources, an individual is destined to fail. In the case of yesterday's wild wrong-way Corrigan of a Corvair the issue wasn't rope but greenbacks, as according to 76% of you the seller was demanding way to many for the right to own the unique beast. Speaking of beasts, how many of you have ever ridden a horse? 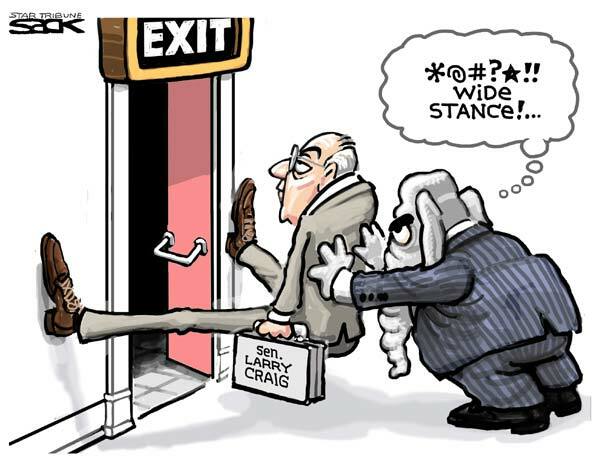 I have on occasion and what stuck with me afterward was the intimidating size of the animals, and how walking after the ride made me feel like Larry Craig at the airport. That's why I prefer my ponies to be of the Ford kind. It seems the Blue Oval boys have cornered the market on equine epithets and two of the most well known are Mustang and Bronco, both of which came about in the '60s. And yes, before the indignant replies come streaming in, I know the Mustang was named not after the horse but for the P51 airplane. . . which was named after the horse. The Mustang (car) is still with us, but while the Bronco was once successful enough to sire a II, both it and its offspring have been unceremoniously ushered off to the glue factory. Today's 1987 Bronco II not only has been saved from an ignominious fate but it's also apparently gotten busy with a 'Stang at one point or another, having been imbued with the hot edition of that car's 5.0 and five-speed gearbox. It's also pretty damn cool looking if you ask me. The ad is light on the details of the drop-in, but does note that it's an injected 302, which of course is nice unless you'd rather be blown. The 5.0 is a reliable way to put ponies in your pony and fitting it to the Ranger-based Bronco isn't rocket science, Smithers! The little truck was also available with a row-yet-own so the five speed's not in alien territory either. Four wheel discs add potential stopping prowess to the happy-making too. Of course putting a lot of power into the tall in the saddle Bronco II is in many ways asking for trouble, but this one mitigates that problem by being hunkered down on its 17" Mustang GT wheels. That also goes a long way in making this Bronco about the most badass looking one out there. The two-tone paint looks perfectly serviceable in the pics and while there is the caution of some wheel well rust, it doesn't look bad enough that you'd have to put this horse down. Other issues brought up in the ad are a need for some TLC owing to the truck having been in storage for an undisclosed amount of time and the cryptic note that the interior needs some finishing touches. I'm thinking doilies and a bowl of ribbon candy but then again what do I know? 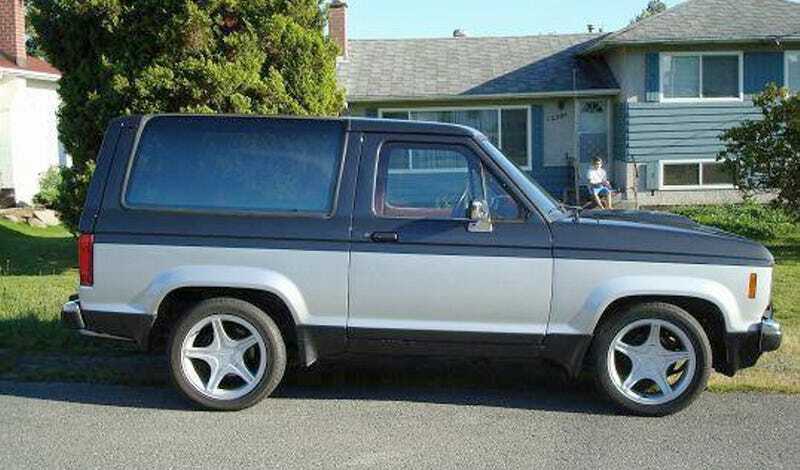 What you need to know is that this 5.0-Bronco is being offered for $4,400, and once again that's in that colorful Canadian money so you'll need to do some maths if you don't happen to be well mannered enough to live in a nation where they can't even bring themselves to dump a crack-whore of a mayor for his drunken debauchery. What a country! 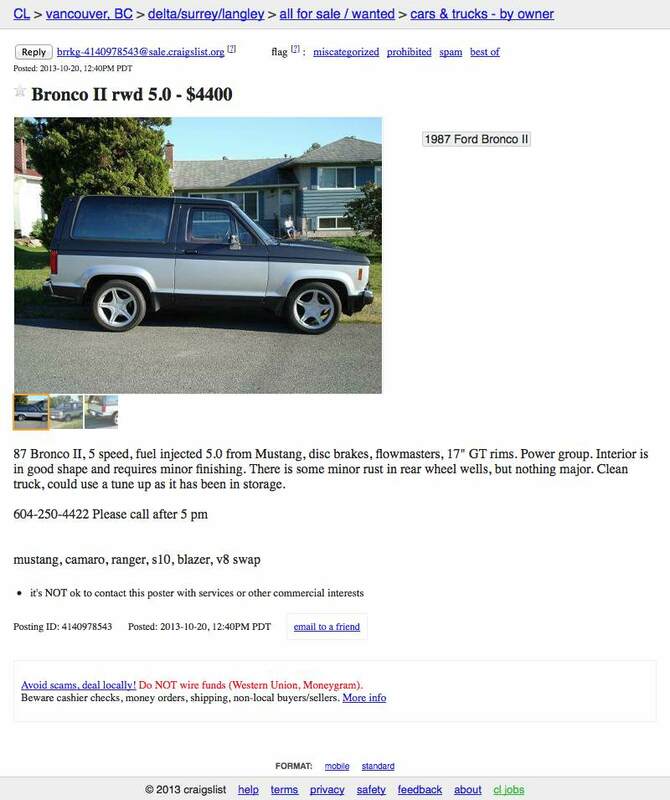 Fortunately, this Bronco II is on the opposite side of the country from that other Ford, and it's now time to decide if this coolio 5.0 truck is worth that $4,400. What do you think, is that a fair price for this untamed beast? Or, does that make this a horse of a different color? Vancouver Craigslist eh, or go here if the ad disappears.